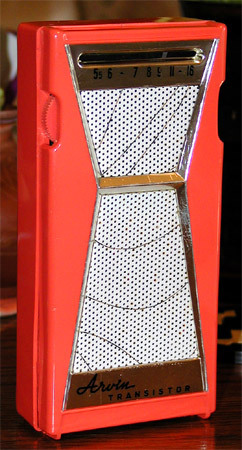 Another colorful one from Arvin Industries that was made in 1957. This one listed for $59.95, or ten bucks more than the 8576. Makes sense if we consider it sported an extra (sixth) transistor. The lack of any cover over the tuning dial reminds me strongly that Arvin made strip heaters and other exotic stuff for the home. Maybe the extra ten bucks is for that custom open-air styling? This one features the same big, goofy belt clip as the Arvin 8576 and I'm still trying find a belt and pants to go with these radios. Did I mention how BIG this and the 8576 are? They stand over six inches tall. What you might call the skyscraper look? Powered by six transistors that run on 9V premium (Eveready 226, Ray-o-Vac 1600 'n such). A/C is optional. What's that? You wanna see guts? Tired of first-person shoot 'em up games?